I have admired Ken from my early days at the New England Conservatory in the 1970's, particularly as I got to know him better as a very talented saxophone student. He did yeoman work in our NEC recording of 1920's Paul Whiteman repertory recreations, enthusiastically playing a variety of saxophones and, if I recall correctly, bass clarinet. Since then Ken has over the years exhibited an unwavering and selfless devotion to both his own students (just as his own teacher Joseph Allard did) and the creation of new musical works. My new Saxophone Sonata is the second of my works to be premiered by Ken Radnofsky. Before World-Wide Concurrent Premieres existed as an organization to commission new works, Ken gathered together all of Joe's former students to commission my Concerto in Allard's honor. Congratulations on thirty years of devoted teaching and beautiful music making! My daughters Lauren and Julia. Michael Colgrass' Preview was written to celebrate Ken Radnofsky's 30 years of teaching. The short work, which is just 42 measures long, is nevertheless, a work of many moods, exploring the chameleon-like nature of the saxophone, and notated in the score as follows: playfully; like a murmur; agitato; wistfully; like heckling; agitato; light, playful; light-hearted. The work is both a preview for today's concert, and the Concerto for Saxophone and Wind Orchestra, which will be premiered by Ken Radnofsky in 2001 at The Boston conservatory, as a "World-Wide Concurrent Premiere." Jakov Jakoulov's Bernstein 'Anniversary' was written as a tribute to Leonard Bernstein, as part of a celebration of Leonard Bernstein's birth, called 'Bernstein 80,' produced by the Community Music Center of Boston, of which Messrs. Jakoulov and Radnofsky are faculty members, on April 30, 1999, at the Rabb Auditorium of the Boston public library. 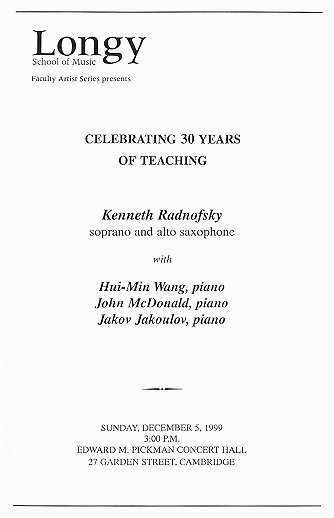 David Amram's work was written to celebrate Kenneth Radnofsky's anniversary as a teacher. Radnofsky and Amram have known each other since 1979, when Radnofsky performed at the Cambridge River Festival as part of an ensemble conducted by Peter Cokkinias, formed especially to perform Amram's works. At that time, Amram accepted a commission to write a Concerto for Saxophone and Orchestra, entitled Ode to Lord Buckley, which was premiered by Kenneth Radnofsky and the Portland Symphony, Bruce Hangen conducting, in March 1981. Since then, the Concerto has become one of the most performed works in the Saxophone Concerto repertoire. Historically, the Divertimento was usually written for small groups of instruments (three to ten). I have chosen this title more for its meaning (from the verb: to entertain) than for any historical considerations. It is also probably safe to assume that in writing divertimenti composers meant them to be entertaining for both the performer and the listener. This Sonata was commissioned by the World-Wide Concurrent Premieres and Commissioning Fund (WWCPCF), described below. There are 71 total performers (duos) performing the Schuller Saxophone sonata, with representation all over the US, France, Switzerland, Taiwan, Singapore, and Italy. The work bears a dedication to Kenneth Radnofsky. The work was completed in October 1999 and receives its world premieres beginning Dec. 5, 1999. World-Wide Concurrent Premieres and Commissioning Fund is a non-profit organization dedicated to the commissioning and performance of new works by today's finest composers, whether well known, lesser known or emerging composers. WWCPCF is unique from other organizations because it promotes multiple performance world-wide, many of which occur on a first premiere date. All performers pay a portion of the composer's commission, and all pay the same amount, to produce the work. All performers receive an autographed limited edition performance score, signed and numbered by the composer, as well as exclusivity with regard to performance of the work for a period of time subsequent to the world premiere (usually 6 months to 1 year0. The organization has produced works for saxophone and piano, saxophone and orchestra, saxophone, cello and piano, wind ensemble, horn trio (horn, violin and piano), and choir during the 8 years, including works by Chris Theofanidis, John Harbison, Larry Bell, Frank Ticheli, Michael Horvit, Gunther Schuller, and Yehundi Wyner, whose Horntrio was the runner up for last years' Pulitzer Prize. Future commissions include a Concerto for Saxophone and Wind Ensemble by Pulitzer Prize winning composer Michael Colgrass. Performances have been produced in all parts of the world, including Cyprus, Switzerland, Taiwan, England, Singapore, Italy, and all parts of the US in cities and towns, both small and large. The work of WWCPCF in promoting grass-roots world wide premieres has been recognized in a grant from the Aaron Copland Fund for Music, and in the feature articles in both Chamber Music Magazine and the New York Times. WWCPCF was founded by Kenneth Radnofsky, who continues to serve as Executive Director. I first heard Martino's music in 1974 as a student at New England Conservatoty. Mr. Martino was a faculty member; he had just won the Pulitzer Prize for Nortturno. I immediately asked him to write a concerto, and finally worked out the details of a commission and performance by 1984, with an NEA Consortium Commissioning Grant, culminating in a performance of the Concerto at Monadnock music in 1987. I recorded the concerto for New World Records with conductor Richard Hoenich and the NEC Symphony Orchestra in 1996. My professional relationship with Don has become a friendship, which I appreciate fully, along with all of those friends/teachers whose music I perform on this concert. "San Antonio," by John Harbison, was commissioned by World-Wide Concurrent Premieres and Commissioning Fund, Inc. In an event without known precedent, Mr. Radnofsky arranged for the commissioning musicians to share the premiere performance - 43 saxophonists around the world gave the world premiere on Dec. 3, 1995. And, over 100 performances were given in just 1 year. The Summons: The traveller has a free afternoon in San Antonio. It is August, 105 degrees. Expecting to start with a cool promenade along the river, he is instead lured by a sound. He follows it up a long stairway and finds himself in a little fiesta: a hot square, many people, no shade, a few people dancing to a fast beat, the band playing and singing in SPANISH. Line Dance: The first dancers finish, exhausted. Then, as if on cue, the whole crowd gets into a line of people of all ages nine to ninety. They all know the steps, which change with the phrases. Couples' Dance: The music changes again becoming slower. The people continue on in couples. No one seems to feel the heat and the band hardly stops. Everyone, the traveller included sinks into it. Towards the end a young girl asks the traveller to dance. He declines. But a year later, when the tourist puts down the memory of the sounds, something about a saxophone, and a few rhythms in his distorted memory, he accepts. friends, alumni, foundations, and corporations. A state agency that supports programs in the arts, humanities and sciences.